The new PSC PowerStar EuroLiFE is based on our very successful PowerStar LiFE. This new unit was designed to complement our new PSC Euro Cart. Small in size and big in power output, the PSC PowerStar EuroLiFE will power everything on our new cart with ease. 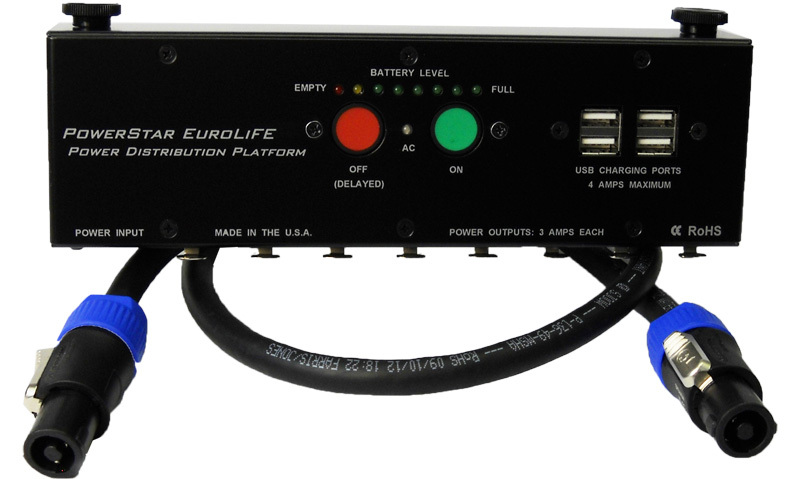 The main power distribution unit is very small and compact. It easy installs without tools under the handle assemble of our new cart or virtually any cart for that matter. Power is carried from the Battery/AC Supply/Charger via a heavy duty 12AWG cable using 4 pole Neutrik SpeakOn connectors. Our Simple, yet accurate battery “Fuel Gauge” allows the operator to see their remaining battery power with just a quick glance of the multiple colored LEDs. There are four convenient USB charging ports located right up front for easy access. The totally available output current is 4 Amps……the highest in our industry. Need to charge your iPhone, iPad or other USB chargeable devise? No problem. All of the power output XLR connectors face downward to allow clean and clutter free cable routing. This power Supply like all of the other PSC power products contains our exclusive PSC Quite Power Technology. Every output is equipped with custom designed output filters to help eliminate inter-modulation noise caused when powering multiple devices from one power source. PSC is the only company that takes the time and expense of adding these components because we believe quiet audio starts with quite DC power. If it’s worth powering, it’s worth powering correctly. While no power filter can eliminate all potential noise issues, we feel the added value of our filters make the PSC line of power products better than the rest. This design in feature is a PSC exclusive.